MAN #2: (Exhales a cloud of smoke) It's a fu**ing great movie, man! MAN #3: Do we have a comic like that? MAN #1: No. . .but check this out. I got this great idea. MAN #3: Say it, man! MAN #2: Hey. . .pass that $hit! Fu**ing bogart. MAN #1: You know Jonah Hex? How about we make him like. . .IN THE FUTURE! MAN #2: (coughs loudly, almost choking) WHAT? He's a fu**ing cowboy! MAN #3: (Thinks a moment, then blows a huge cloud of smoke) Do it. MAN #3: DO IT, MAN! The scenario above is about the only way I can see how this comic series happened. Oh, sure. . .there's some interviews and such describing a much more thoughtful decision-making chain, but I have the feeling that those were trumped up to conceal the actual thought process of turning Jonah Hex into a post-apocalyptic warrior. Can this idea possibly be any good? Let's find out! ONCE UPON A TIME. . .IN THE WEST?!? Jonah Hex is pulled from 1875 almost 200 years into a post apocalyptic future, captured and held prisoner for an unknown reason. Hex escapes his prison and rescues a beautiful woman, who invites him to join a sketchy gang. Hex ends up eating giant grasshopper and realizing he's thrown in with the wrong kind of people during a raid gone bad. . .
Hex hits the ground running with a great first issue! 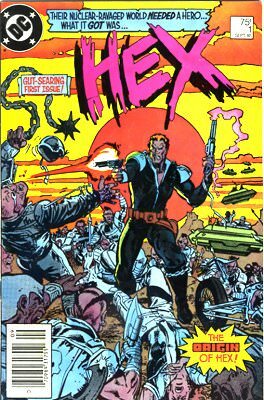 It's mostly action, as Hex makes his escape after being kidnapped through time, and then goes on a water raid with a wasteland gang, but it does slow down a bit a couple of times for some info-dumping on the scenario. . .it's 5 years after a nuclear holocaust in the year 2050, and except for a few pockets of civilization, the world is a chaotic wasteland with barely any water. In other words, Jonah Hex meets Mad Max. . .but it works! The art by Texeira is very nicely done throughout and really helps sell the strange idea of this series. The scene of Hex witnessing a 15 foot long grasshopper being barbecued for dinner is a definite standout, letting Hex (and the reader) know for SURE that he ain't in Kansas anymore. There's a few problems. . .the villain's info dump at the beginning is informative, but seems out of place, and Texeira's vehicle designs are the weakest part of the art. . .but other than that, this is overall a great start to the series. Hex teams up with a squad of Vietnam war soldiers also kidnapped through time and decide the best strategy is to return to the place where Hex was originally imprisoned and try to find the time machine. 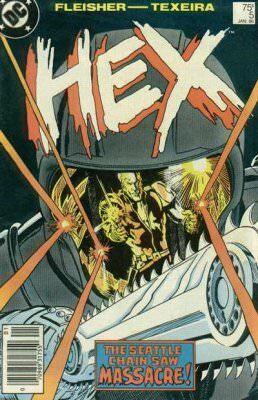 Hoping to find something to help them, Hex and the soldiers make their way to an abandoned military base, where they are saved from cyborg dogs by the woman Hex rescued in the first issue (Stiletta), who then helps them infiltrate the high-tech installation where Hex was imprisoned. . .but she turns out to be a robot sent to lure Hex back. Hex makes his escape, but is forced to leave behind his new comrades. . . There's a LOT packed into these issues! Once again, this issue is mostly action, but there's a lot of it, along with several twists and turns. It's almost exhausting to read, to tell the truth. There's more stuffed into this single issue than gets put into a year's worth of story in today's comics. 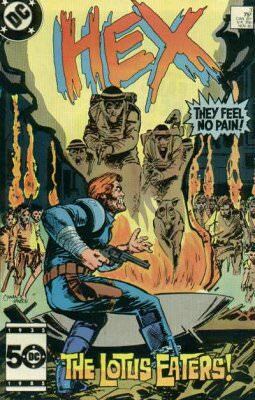 Unfortunately, the background of the new world Jonah Hex finds himself in suffers for the sake of the relentless action, becoming a vague sort of stage scenery. That and the way this series is ALREADY heading toward lots of robot punching. . .er. . .shooting. . .knocks this second issue down a rung or two from the great opening issue. 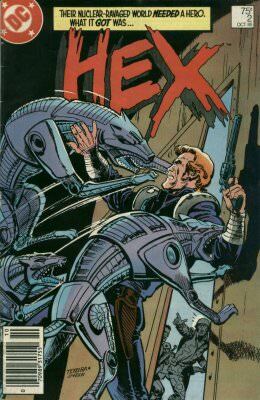 After Hex's escape from the trap set for him, he eludes his pursuers and finds himself working as a bodyguard for a drug dealer. Hex realized that he's thrown in with the wrong crowd AGAIN and kills the dealer then steals his ship to continue his getaway into the wasteland. . . Drugs are bad, kids. This Public Service Announcement brought to you courtesy of Jonah Hex and a goddamn bullet to the head. That's pretty much the story on this issue. It seems like a filler issue more than anything. The art by Texeira continues to impress (except for his awful vehicles), but the inking by Garzon takes things down a notch, compared to the previous two issues. It just goes to show that a good inker is just as important as good pencils. Hex crash lands his stolen flyer and encounters Stiletta in the wasteland. Together, they go in search of water without realizing that Hex is being pursued by the partners of the drug dealer he killed. An encounter with bloodsucking worms in a pitch black cave convinces Hex his life has taken a definite turn for the worse. All that AND the origin of Hex's kidnapper. . .Reinhold Borsten. . .who is a time traveler who learned about the upcoming nuclear apocalypse and traveled forward with advanced technology in order to rule society. He captures warriors from various eras of time in order to pit them against each other in high-stakes games with other wealthy survivors. 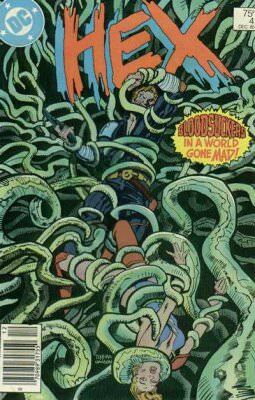 There's still plenty of action in this issue. . .especially the horrific encounter with the titular worms, but things slow down a bit for some world building, giving us more information to fill in some of the sketchy outlines of post-apocalyptic 2050 America. Overall, a pretty good issue with just the right mix of story and action. The Conglomerate (A de facto wasteland government made up of surviving organized crime families) sends a deadly assassin after Hex and Stiletta for killing a squad of hit men they sent after Hex killed one of their drug dealers. The assassin strikes as Hex and Stiletta hijack a shipment of Conglomerate Soames (water purifying tablets that are wasteland currency controlled by The Conglomerate) and is defeated only after a brutal battle, but in the end, Hex and Stiletta are captured by The Conglomerate. . .
Once more, this issue is pretty much all out action, but there is a bit more world building with the introduction of another faction trying to control the American wasteland. Unfortunately, The Conglomerate seems a bit weak and cliche. 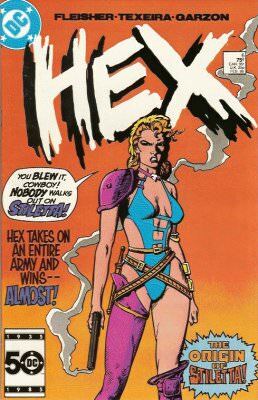 The assassin they send after Hex has a definite feel of "Villain of The Month" to him. . .as he's introduced and defeated in the same issue. Texeira's art also continues to suffer a bit with Garzon's inks. After the Conglomerate captures Hex and Stiletta, they tell Hex that they want to hire him to destroy Borsten's time machine in order to prevent him from going back in time to undermine The Conglomerate's present hold on power. . .and that the best way for Hex to get inside is to allow himself to be captured and then escape with the help of an inside man. Hex agrees, as long as he can use the time machine to send himself back before blowing it up with a time charge. Stiletta reveals that she's Borsten's daughter and also wants to infiltrate Borsten's base in order to kill him. Hex is like. . .whatever, just don't get in the way, woman. Stanley Harris (one of the Vietnam soldiers Hex had to leave behind in issue #2) escapes captivity and is running loose through Borsten's base. First off. . .great cover! Texeira may be $hit at drawing vehicles (and there's some truly God-Awful ones in this issue), but he can damn sure draw women right. As for the issue itself. . .it's a bit weak, but not bad. It feels like it's leading up to an explosive conclusion soon. There's some more background on the world, but this time around it seems a bit too long to serve the simple purpose of the story. . .The Conglomerate wants to remove Borsten's most powerful weapon, his ability to travel through time, and Hex is just the one man army with the proper motivation to do it. Overall, this issue isn't bad, but feels a little bloated, especially when you add in the sub-plot of the Vietnam soldier escaping Borsten's captivity and Stiletta's subplot about wanting to kill her father. Overall, despite some weak points in the story and Texeira's strange inability to draw futuristic vehicles that don't look ridiculous, these first 6 issues are a surprisingly strong opening for this series. As a huge Jonah Hex fan, I was a little skeptical about the whole idea, but am pleasantly surprised to find myself enjoying these comics more than I ever thought I would. Now let's not be hasty and call them GREAT. They're nowhere close to great. They're pretty good, but ultimately the story is nothing but a vehicle for action scenes. . .sort of like the story in a Call of Duty video game. It's there and it's pretty good, but once the action starts, you sort of forget it until the next bit of story comes along to remind you there's other stuff going on besides shooting. Now that I think of it. . .this would probably make a decent video game. It sort of has the same "story/action/story/action/story" construction as your typical shooter. More Hex! Issues 7 - 12. Can they keep this thing on the rails for at least a few more issues?